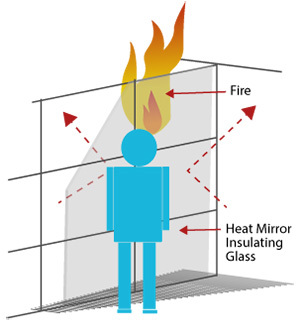 Why Install Heat Mirror Glass? Heat Mirror™ insulating glass incorporating Heat Mirror films coated by Southwall Technologies was the world's first commercially produced low-e glass. Since 1980, Heat Mirror insulating glass has been used around the world in structures ranging from single family homes to high profile projects for Fortune 500 companies. Southwall manufactures 12 different coated films which are suspended in the middle of an insulating glass unit to create multiple insulating cavities, creating industry leading performance. Heat Mirror film technology utilizes nanoscale coatings of metal which reflects heat back to its source, hence the name: Heat Mirror, a mirror to heat. Coated Heat Mirror films are often used in conjunction with low-e glass, taking advantage of the benefits of both film-based coatings and glass based technologies. Inert gases, such as argon or krypton, are added to create Heat Mirror™ insulating glass units with industry leading performance. Outstanding winter insulation and superior solar control provide year-round savings and enhanced comfort. In addition, Heat Mirror's UV protection helps protect furnishings from fading, while Heat Mirror's noise reduction maintains a quiet internal environment. With an optional Krypton gas filling, single-film/dual-cavity Heat Mirror Insulating Glass can achieve a U-value of 0.10 (R-value of 10). Check out this article from Popular Science Magazine also this article here. Heat Mirror™ insulating glass blocks 99.5% of the sun's destructive ultraviolet (UV) radiation, helping reduce damage to valuable furnishings and protecting upholstery from fading and deterioration. Heat Mirror's exclusive XUV® fading protection umbrellas your furniture, drapes and carpeting, providing the ultimate in UV protection. 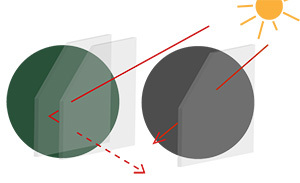 Laboratory studies indicate that fabrics behind clear Heat Mirror glazing resist fading and retain their original color up to three times longer than fabrics behind clear single pane glass. Heat Mirror’s clear glazing also protect plants by transmitting photo-synthetically active radiation and controlling excessive temperature swings and thermal stress that can stunt growth. Condensation is a warning that heat is escaping through your windows. Worse, condensation can ruin your view, stain your windows and destroy wall coverings. 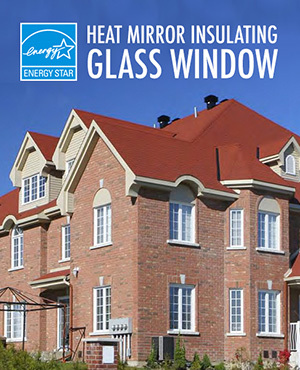 Heat Mirror™ provides up to four times the insulation of dual pane windows, which helps reduce condensation. Heat Mirror resists wintertime condensation at exterior temperatures up to 45 degrees colder than conventional insulating glass, a particularly important benefit for pool and spa enclosures, computer rooms, and other high-humidity environments. Even when outside temperatures are very low, Heat Mirror™ keeps the interior glass temperature close to the room temperature, reducing drafts and chilly spots near windows. Saves Energy and the Environment. 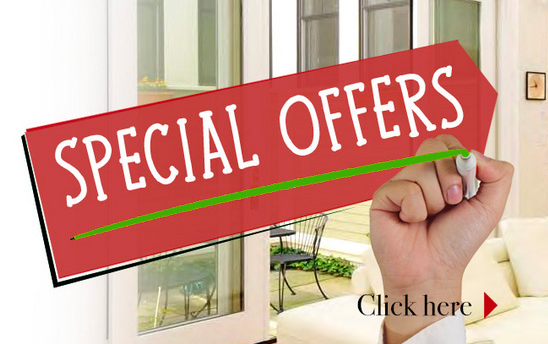 Twenty-five percent of heating and cooling energy escapes through the windows of your home. Heat Mirror glass is up to four times more effective than standard double pane glass in reducing heat loss, providing superior thermal performance. When the sun threatens to overheat rooms, Heat Mirror blocks twice as much heat from entering your home, reducing air conditioning expenses. You save money and improve your comfort level all year round. In fact, windows with Heat Mirror glazing systems can return your investment by producing a reduction in annual energy expense. And by saving energy, you’ll also be saving the environment. Copyright © 2019 The Freedom Window | All rights reserved.